Must it always be high-voltage? In Spain, the region of Andalusia offers not only an impressive legacy of monuments, fashionable beach-places and Europe's largest concentration of well-watered golf courses, but also demonstrates technical progress in research and use of solar energy. Here I can recommend a trip to the Plataforma Solar de Almeria (PSA) and to Andasol 1 to 3, Europe's first parabolic trough power plants and currently the largest solar power plants in the world. Both are located between Granada and Almeria - only 60 km apart from each other. The Plataforma Solar de Almeria is located near the Spanish village of Tabernas. At this time, it is the largest European research and development center for concentrating solar power (CSP). Since its founding in the early eighties, the use of solar energy for generating electricity and hydrogen as well as systems for electrochemical water purification are developed. Already 28 years ago they made initial tests with parabolic trough solar systems for steam and heat. Today, among other things, the tests for a 100-kW system for the direct production of hydrogen, Hydrosol 2, are taking place here. Thoughts about this topic can be found in Arno's EnergyIdeas (30) from February 10, 2009. Parabolic trough solar power plant Andasol 1 (right). In the background, the turbine and generator building and the two salt storage systems. The high voltage leaves to the left. On our website you will find a report about the conduct of the research equipment and facilities (see links). Tabernas was mainly selected due to its intense solar radiation of over 3.000 hours of sunshine per annum. Using a turbine with an output of 49.9 MWt, Andasol 1 is currently the largest solar power plant in the world and the largest parabolic trough power plant in Europe. Initiated and developed by the German company Millennium AG, Erlangen, it was built and is now operated by a German-Spanish consortium. Andasol 2 is in the testing phase, for Andasol 3, the earthworks have begun. At Andasol 3, the Stadtwerke München (SWM, Munic public utility) is involved as well. 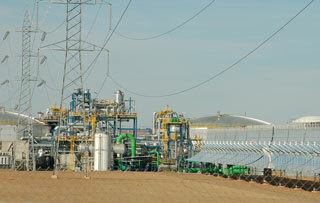 On a surface of 195 hectares (about two square kilometers)for each power plant, oil is warmed up by concentrating solar power through 209.664 mirrors in 22.464 absorber tubes with a running length of almost 90 km (Skal-ET technology)to 400 degrees C. Electricity is generated via heat exchangers with conventional power plant technology (turbine and generator). At this 300 million-euro project, however, a small information booth or even an information sign is missing after all. The first parabolic trough power plants in the world were built in the 80s - and are still operative - in California and Nevada, United States: They initially had no storage capability. Andasol stores a portion of the heat in molten salt, the storage capacity here is approximately 7.5 hours at full load. The electricity produced by the generator is transformed to a higher voltage and fed into the Spanish 400 kV high voltage system at a seven kilometers distant substation. Here the Spanish energy company Endesa purchases it. The substation has been built there, especially because of the new established big wind power plants in this area. At first glance, Andasol is convincing by its sheer size. On the second glance the technology, however, is not a big step forward, especially through the re-employed large centralized power plant technology and the resulting high-voltage power supply required for the existing electricity grid. For comparison: The high voltage grid network in Germany has an incredible length of 1.6 million kilometers (1 mio miles). Perhaps a more decentralized philosophy would be more appropriate? After all, it is just all about hot water. Back in the hotel, the Residencia or Appartemento, one is looking forward to a hot coffee and a warm bath. But stop: for this purpose electricity is needed nowadays. Where does it come from? Ah yes, from the power-outlet. However, it had to be transformed in various stages from its long-haul transmission voltage of 400.000 volt down to 230V. But that’s just fine as it is how it used to be and therefore this status quo is not at all questionable. Or not? What all this has to do with hydrogen and fuel cells, or might have to do, everyone must figure out on its own. To simplify this decision-making process, I recommend a visit to the cultural heritages of humanity in Andalusia, e.g. the Mosque-Cathedral in Cordoba and the Alhambra in Granada. Impressed and inspired by these unique architectural and engineering services, not to forget the work of thousands of craftsmen, something should cross your mind. I would be glad to work with you on these or other energy thoughts in a dialogue.